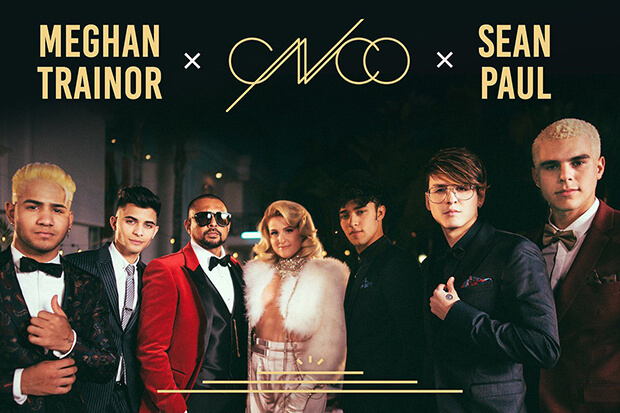 Meghan Trainor & Sean Paul Jump On The Remix Of CNCO's "Hey DJ"
EDIT: You can now stream the song at the bottom of the post. “Hey DJ” is also an interesting detour for Meghan. She recently put the breaks on third LP, Treat Myself, in order to retool her sound. In the meantime, the “No Excuses” diva is keeping busy with features. The 24-year-old recently lent her pipes to Sigala’s “Just Got Paid” and earned a top 20 UK hit. As for Sean Paul, he is never too far from the charts — landing a European hit earlier this year with the David Guetta and Becky G assisted “Mad Love.” Check out the remix of “Hey DJ” below. Are you excited for the remix? Let us know below, or by hitting us up on Facebook and Twitter!